When working with your child practically encourage touch counting as this will help accuracy. Add them together. Write the numbers and the answer. Pick a different pair of numbers. Write the numbers and the answer. If you add up the dots on the top you’ll get 7. Find two dice to roll yourself. Add the numbers that are on the top. What other totals could you get if you roll the dice again? 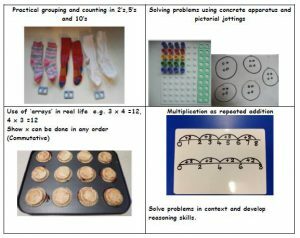 When working with your child at home, using practical real life scenarios to help support maths will always benefit your child. Ask questions for example how many grapes do you have in your bowl? How many will you have left if you eat 3? You can apply subtraction to real life situations e.g. Here is 20p, the apple is 10p how much change do I need? Play board games e.g. snakes and ladders to practice counting backwards. Sing songs (5 little speckled frogs etc). to develop counting backwards. Question through play e.g. how many lego pieces do you have in your tower? Take some away – how many do you have left? Practise maths mountains to develop fluency. 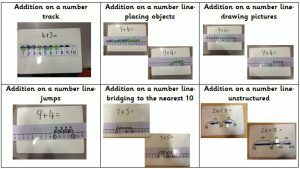 Use a “bar model” to represent subtraction calculations – can they find the missing number? Yasmin and Zach have some bears to share. Which numbers of bears can they share equally so that there are none left over? What do you notice about the numbers they can share fairly? 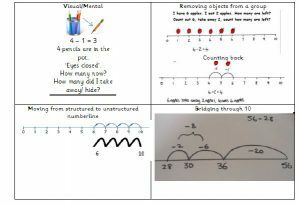 Turn multiplication into story problems e.g. Everyday Jayden has 5 grapes in his lunch box. How many grapes does he eat during the week? Use the vocabulary related to multiplication by asking questions in different ways e.g. What is 2 multiplied by 6? Give me three multiples of 5? What is 4 x 4? How many groups can you see?